AU - Won, Dong Wook. 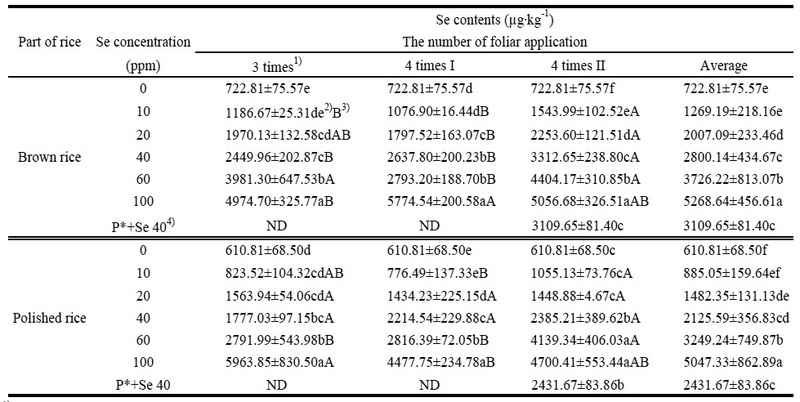 AB - BACKGROUND:This experiment was conducted to examine the effects of organic Se concentration and the number of foliar applications on growth characteristics and Se content in rice.METHODS AND RESULTS:A series of multiple foliar applications were performed at ① 3 times (maximum tillering stage + booting stage + heading stage), ② 4 times I (effective tillering stage + maximum tillering stage + booting stage + heading stage), ③ 4 times II (maximum tillering stage + booting stage + heading stage + grain filling stage) according to the development stage. Each set of the foliar application plots was treated with 0, 10, 20, 40, 60, 100 ppm of Se and with mixed pesticide (P* + Se 40 ppm) in which the treatment time was the same as that of the treatment 4 times II. The total cultivation period of rice was 184 days. Se contents in rice (brown rice, white rice) were analyzed by ICP.CONCLUSION:The number of grains per head tended to decrease with increasing concentrations of organic Se in all treatments. However, number of panicles per hill did not show statically significant differences between the 3 times and 4 times I treatments. The grain yield decreased with the 3 times and 4 times II, but there was no significant difference in 4 times I. Se content in brown rice was the highest at 100 ppm Se (5268.64) treatment and lowest at 10 ppm Se (1269.19 μg⋅kg-1) treatment. Se content in the polished rice was the highest at 100 ppm Se (5047.33) treatment and lowest at 10 ppm Se (885.05 μg⋅kg-1) treatment. The higher selenium was treated, the higher Se content was found in the rice (brown rice, polished rice). Won, D. W., & Kim, S. J. (2019). Development of Selenium Value-added Rice by Organic Selenium Foliar Spray Application. Korean Journal of Environmental Agriculture, 38(1), 47-53. Won, Dong Wook, and Sun-Ju Kim. “Development of Selenium Value-added Rice by Organic Selenium Foliar Spray Application.” Korean Journal of Environmental Agriculture 38.1 (2019): 47-53. 1. Won DW, Kim SJ. Development of Selenium Value-added Rice by Organic Selenium Foliar Spray Application. Korean Journal of Environmental Agriculture [Internet]. 2019;38(1): 47-53. Available from: doi:10.5338/KJEA.2019.38.1.6. Won, Dong Wook,and Sun-Ju Kim. “Development of Selenium Value-added Rice by Organic Selenium Foliar Spray Application.” Korean Journal of Environmental Agriculture 38, no.1 (2019): 47-53. doi: 10.5338/KJEA.2019.38.1.6. This experiment was conducted to examine the effects of organic Se concentration and the number of foliar applications on growth characteristics and Se content in rice. A series of multiple foliar applications were performed at ① 3 times (maximum tillering stage + booting stage + heading stage), ② 4 times I (effective tillering stage + maximum tillering stage + booting stage + heading stage), ③ 4 times II (maximum tillering stage + booting stage + heading stage + grain filling stage) according to the development stage. Each set of the foliar application plots was treated with 0, 10, 20, 40, 60, 100 ppm of Se and with mixed pesticide (P* + Se 40 ppm) in which the treatment time was the same as that of the treatment 4 times II. The total cultivation period of rice was 184 days. 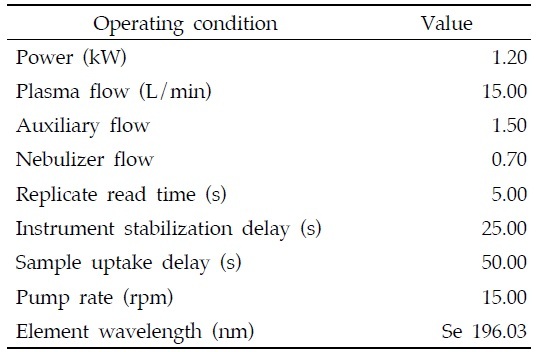 Se contents in rice (brown rice, white rice) were analyzed by ICP. The number of grains per head tended to decrease with increasing concentrations of organic Se in all treatments. However, number of panicles per hill did not show statically significant differences between the 3 times and 4 times I treatments. The grain yield decreased with the 3 times and 4 times II, but there was no significant difference in 4 times I. Se content in brown rice was the highest at 100 ppm Se (5268.64) treatment and lowest at 10 ppm Se (1269.19 μg⋅kg-1) treatment. Se content in the polished rice was the highest at 100 ppm Se (5047.33) treatment and lowest at 10 ppm Se (885.05 μg⋅kg-1) treatment. The higher selenium was treated, the higher Se content was found in the rice (brown rice, polished rice). 벼(Oryza sativa L.)는 한국⋅중국⋅일본⋅동남아시아에서 주식으로 삼고 있는 곡류 중 하나이다. 우리나라는 농경사회를 시작하면서부터 삼국시대부터 쌀이 주 식량원이 되었으며, 지금도 주식으로서 중요한 자리를 차지하고 있다. 쌀은 낟알의 모양에 따라서 장립종, 중립종, 단립종으로 나누며 함유된 전분의 아밀로오스 함량에 따라 찰벼와 메벼로 나눈다. 우리나라와 일본에서 재배하는 쌀은 단백질과 아밀로오스의 함량을 줄여 윤기 있고, 찰진 품질의 자포니카 타입(O. sativa L. ssp. japonica)이며 동남아시아에서 생산되는 쌀은 장립종으로 아밀로오스와 단백질 함량이 높으며 밥이 고슬고슬한 인디카 타입(O. sativa L. ssp. indica)이다(Choi, 2010). 동남아시아에서 생산되는 쌀은 장립종으로 아밀로오스와 단백질 함량이 높으며 밥이 고슬고슬한 인디카 타입이며, 쌀을 하루 섭취(232 g)하여 얻을 수 있는 무기성분의 함량은 칼륨(K) 261.20, 마그네슘(Mg) 72.58, 칼슘(Ca) 10.74, 소듐(Na) 1.47, 아연(Zn) 3.22, 철(Fe) 0.81, 구리(Cu) 0.37 mg, 셀레늄(Se) 9.5 μg이다. 최근엔 쌀의 영양학적인 면을 재조명하면서 쌀의 기호성 뿐만 아니라 기능성에 대한 연구가 활발히 진행되고 있다. 감자나 식빵보다 쌀밥 섭취 시 혈당 및 인슐린 분비가 낮으며, 쌀밥의 형태가 가루나 죽, 떡 등 가공형태보다 혈당량의 급격한 증가나 인슐린 분비를 억제하고, 돌연변이억제 활성이 있으며 가공형태인 밥, 백설기, 미숫가루 등도 억제활성이 소실되지 않아 항 돌연변이 활성이 있다. 최근에는 서구화된 식습관으로 국내 쌀 소비시장은 점차 감소되고 있으며, 무역시장 개방으로 쌀 가격 경쟁력이 약화 되고 있어, 기능성 쌀 개발에 대한 관심이 필요하다(Park et al., 2010). Se은 우리 몸에 필수적인 미량원소(무기질)이다. Se에는 식물체에서 오는 무기성 Se(selenate, selenite)과 유기성 Se(selenomethionine, selenocysteine) 모두 포함하고 있다. 사람 등의 동물체 내에서는 주로 셀레노시스테인(Selenocysteine)과 셀레노메티오닌(selenomethionine) 등의 셀레노 아미노산 형태로 존재하며(Fig. 1). 많은 연구에서 Se은 종양질환을 억제하는 효과가 있는 것으로 알려져 있는데 이는 암환자에게 혈청 내 Se 농도가 비정상적으로 낮게 나타나는 것과 연관이 있다. 또한 Se은 암세포의 성장을 억제하면서 암세포의 자살을 유도해서 여러 발암물질의 활성화를 막고, 각종 바이러스성 질병에도 상당한 방지효과가 있다고 밝혀졌다. 작물 체내에서 Se은 무기 형태와 유기 형태의 두 가지 구조로 존재 하는데 인체에 유익한 Se은 유기 결합된 Se이 무기 결합된 Se에 비해 인체 이용률 및 지속성이 더 큰 것으로 알려져 있다(Choi et al., 2010). Se은 세계보건기구(WHO)와 유엔식량농업기구(FAO)로부터 인간이 반드시 섭취해야 할 필수 영양소로 공식 인정받게 되었으며, 이후 1978년 세계보건기구(WHO)에서는 Se을 동물 필수 영양소로 인정하고, 1일 권장량을 50∼200 μg으로 결정하였다. 최근에는 이러한 Se의 약리효과를 농업분야에 응용하여 Se을 함유한 농작물을 재배하여 생산자는 기능성 농산물로 차별화 하여 고소득을 올리고, 소비자는 Se의 약리효과를 가장 안전한 식물성 유기 Se으로 식품을 통해 섭취하고자 하는 시도가 이루어지고 있다(Kim, 2011). 현재 우리나라의 Se 섭취량은 우리나라 국민의 Se 평균섭취량 68.6 μg/person/day와 상한 섭취량 400 μg/person/day를 HI UL(식 1.1)에 대입하여 계산하면 0.068 mg/day/0.40 mg/day=0.17로 HI값이 1이하였다(한국인영양권장량 8차 개정, 2005). 이와 같이 국민 Se 섭취량은 권장 섭취량을 밑돌고 있다(Department of Health & Human Service of Korea, 2001). 중국에서는 토양 속의 Se 함량이 낮아서 (0.125 mg/kg 이하) 케샨병(KSD: Keshan disease)이나 케신백병(KBD: Kaschin‐Beck disease)이 발병하는 곳도 있으며, 북한에서도 Se의 부족으로 케신백병이 발생한 예가 보고 되어 있다(Choi, 2008). 국내에서 연구 중인 기능성 쌀은 본 실험과 유사한 무기성분인 게르마늄의 토양시비나 엽면시비를 이용한 기능성 쌀 개발이나 베타카로틴을 이용한 유전자 변형 쌀, 오미자 추출물이 코팅된 기능성 쌀 등이 있다(Song et al., 2006). 매년 이와 같은 연구동향을 보았을 때, 국내 환경에 적합하며 섭취하기 편리한 Se 강화 쌀을 연구, 개발 하여 국내외 쌀 시장에서의 경쟁력을 키울 필요성이 있다. 중국에서는 2011년부터 수입량이 수출량을 초과하였으며 수입량은 계속 증가하여 2015년에는 4%(532만톤)을 수입하였고, 2003년 국내 554종류의 브랜드에서 판매중인 1,034개의 쌀 중 기능성 쌀은 14 개로(NAQS: 국립농산품질관리원, 2004) 기능성 쌀 소비량이 점차 늘고 있다. 따라서 본 실험은 유기 Se을 벼의 생장단계에 따라 농도 및 처리 횟수별로 엽면시비 처리하여 Se 강화쌀을 개발하는 것이다. 엽면시비는 토양관주나 뿌리 흡수처럼 특정 무기물이나 양분의 흡수가 제한적이지가 않고 빠른시일 내에 작물의 생육을 정상적으로 회복시키는데 능률적이며, 효과적인 방법으로 알려져 있다(Song et al., 2006). 또한 이 연구결과를 통하여 Se 함유 최적의 기능성 쌀을 개발하기 위한 벼의 재배방법을 제시하는 것이다. Chelate‐Se(이하 유기 Se, 2,000 mg L‐1)은 펩타이드와 유기 Se을 결합한 미량요소복합비료로(Bionel Co., Ltd, Nonsan, Korea)에서 제공되었다. Nitric acid (HNO3)은 Se 추출 용액으로 Samchun Pure Chemical Co., Ltd. (Pyeongtaek, Korea)것을 사용하였다. 농약은 제초제인 론스타(Kyung nong co., Ltd, Seoul, Korea)를 사용하였다. 벼(O. sativa L. ssp. japonica)는 농업 기술원에서 보급하는 볍씨(벼 ‘삼광’)를 비닐하우스(충남대학교 농업생명과학대학교)에서 2016년 4월 27일 모판(30 × 50 × 10 cm3)에 파종하였다. 파종 후 33일(day after sowing, DAS)에 어린모를 가로 15 cm, 세로 30 cm의 재식간격으로 부속농장 실험 포장에 이앙기로 이앙하였다. 벼의 생장단계는 유효분얼기(effective tillering stage, 63 DAS, 6월 28일), 최고분얼기(maximum tillering stage, 78 DAS, 7월 13일), 수잉기(booting stage, 108 DAS, 8월 12일), 출수기(heading stage, 116 DAS, 8월 20일), 등숙기(grain filling stage, 130 DAS, 9월 3일)로 구분하였다. 이에 따라 처리 시기 및 횟수별 처리구를 ① 3회 처리구(최고분얼기 + 수잉기 + 출수기), ② 4회 처리구 I (유효분얼기 + 최고분얼기 + 수잉기 + 출수기)와 ③ 4회 처리구 II(최고분얼기 + 수잉기 + 출수기 + 등숙기)로 나누어 수행하였다(Fig. 2). 각 시기 및 횟수별 처리구는 유기 Se 2,000 mg⋅L‐1 제제(농도)을 10, 20, 40, 60, 100 ppm(식 2.1 ~ 2.5)으로 희석해서 엽면처리 하였고, 구체적인 농도는 다음과 같다. 유기 Se 엽면처리는 처리 제제를 농업용수로 농도에 따라 농업용수로 희석하여, 3 L씩 전자동분무기(Kwangsung Co., Deajeon, Korea)로 수행하였다. 벼 재배 면적은 총 17개 구획으로 나누어, 한 처리구 당 18 m2(6 m × 3 m, 5.45평)이고, 비 실험구 포함 총 924 m2(22 m × 42 m, 280평)이다 (Fig. 3). 각 처리구 배치는 분할구 배치법으로 하며, 처리구 상호간 영향이 적도록 구획 간 전후좌우 2 m 무처리 간격을 두었다. 처리구간 사이에는 렉산골판(Koem Co., Paju, Korea)을 논물을 통해 Se 제제의 확산을 차단하기 위한 차단막으로서 설치하였다. 벼 수확은 184 DAS(10월 27일)에 수행하였고, 총 재배기간은 184일이었다. 재배 기간 동안 기상 환경은 기상청 자료를 참고 하였다. 처리구별 생육조사용 벼 5주를 선택하여 천립중, 유효분얼수, 영화수를 조사하였다. 수확량은 생육조사 결과를 바탕으로 10 a 당 수확량 공식(식 3.1)에 대입하였다. 각 처리구의 벼는 콤바인으로 탈곡하여 61일간 비닐하우스에서 자연건조 후 정미기(Dongyang CO., Daegu, Korea)로 현미(3분도, 2 kg), 백미(8분도)로 도정하고, 65℃ 열풍건조 한 후 분말(100 g) 하였다. 쌀 분도별(현미, 백미) 분말 시료는 1 g을 50 mL‐Digi tube에 넣어 HNO3 10 mL와 혼합하였다. 혼합액을 실온에서 17시간 정치 후 산 분해기(DigiPREP MS, SCP Science Inc., Quebec, Canada)에서 150∼170℃로 5시간 분해하였다. 분해액이 투명해지면 분해가 완료된 것으로 판단하고 분해시킨 여액을 7∼9 mL 될 때까지 같은 온도에서 계속 가열한다(1∼2시간). 자연 냉각을 서서히 시킨 후 50 mL‐Digi tube 벽에 있는 잔여물을 초순수로 닦아내며 여과지(No. 6)로 여과하여 15 mL Falcon tube에 10 mL로 정용한다. ICP로 분석할 때 Se 표준용액을 필요한 농도로 희석하여 농도와 흡광도의 검량선을 작성하고 분석 결과를 대입하여 정량화(mg⋅kg‐1 dry wt.)하였다. 쌀 내 Se 분석 ICP의 기기분석 조건은 다음과 같다(Table 1). ICP분석 결과(n =3)는 Microsoft Office Excel 2016을 이용하여 생육 및 Se 함량에 대한 평균값과 반복(n =3)의 표준편차(SD, standard deviation)를 구하였다. 통계프로그램은 IBM SPSSⓇ version 21 프로그램을 사용하여 일원배치 분산분석(one‐way ANOVA)과 반복측정 다변량 분산분석(repeated measures (ANOVA)을 실시하였고, 유의수준(P)은 0.05 이하로 설정하여 사후분석(post‐hoc analysis)은 Tukey 검정법을 사용하였다. 벼의 단위면적당 수량 요소(영화수, 천립중, 유효분얼수) 중 영화수는 모든 시험구에서 유기 Se의 처리 농도 증가에 따라 감소하는 경향이 있었지만 천립중과 유효분얼수는 3회 처리구와 4회 처리구 I에서는 유의차가 없었다. 처리 시기 및 횟수별에서는 영화수, 천립중, 유효분얼수 모두 유의차가 없었다. 쌀의 단위 면적당 수량은 처리농도가 증가함에 따라 감소하였다(Table 2). 현미 내 Se 함량은 Se 100 (5268.64) > Se 60 (3726.22) > P (농약)+Se 40 (3109.65) > Se 40 (2800.14) > Se 20 (2007.09) > Se 10 ppm (1269.19 μg⋅kg‐1) 순이었다(Fig. 4a). 현미내 Se 함량은 처리 농도가 높을수록 증가하였다(Table 3). 백미내 Se 함량은 Se 100 (5047.33) > Se 60 (3249.24) > P+Se 40 (2431.67) > Se 40 (2125.59) > Se 20 (1482.35) > Se 10 ppm(885.05 μg⋅kg‐1) 순이었다. 백미 내 Se 함량은 현미와 마찬가지로 농도가 높을수록 증가하였다. 즉 유기 Se 처리 농도별 모든 시험구의 평균 Se 함량을 보면, 현미 내 Se 함량은 Se 100 ppm (5268.64) 처리 농도일 때 가장 높았고, Se 10 ppm(1269.19 μg⋅kg‐1) 처리 농도에서 가장 낮았다. 백미 내Se 함량은 Se 100 ppm(5047.33)처리 농도일 때 가장 높았고, Se 10 ppm(885.05 μg⋅kg‐1) 처리 농도에서 가장 낮았다(Table 3). 백미와 현미 간 Se 평균 함량은 10 ppm에서 현미가 백미보다 1.4배, 20 ppm에서 1.3배, 40 ppm에서 1.3배, 60 ppm에서 1.1배, 100 ppm에서 1.0배 그리고 농약 혼합 P+Se 40 ppm에서는 1.3배 높았다. Seo (2010) 등은 흡수된 게르마늄은 대부분 쌀겨에 분포되어 있고, 현미의 게르마늄 함량이 전반적으로 백미에 비해 높다고 보고되어있다. 흡수된 Se도 대부분 쌀겨에 분포되어 있을 것으로 예상되었고 Se 처리 농도가 높을수록 현미 및 백미에서 Se 함량이 증가하였고, 현미가 백미에 비해 Se 함량이 높았다. 현미 내 모든 처리 농도의 Se 평균 함량은 처리구간 유의 차가 있었다(Table 3). 현미 내 Se 함량은 4회 처리구 I가 가장 높았다(Fig. 4b). 백미 내 Se 평균 함량은 현미와 마찬가지로 유의차가 있었으며 백미 내 Se 함량은 4회 처리구 II가 가장 높았다. 현미와 백미 간 Se 평균 함량은 무처리구에 비해 3회 처리구에서 1.1배, 4회 처리구 I에서 1.2배, 4회 처리구 II에서 1.2배 높았다. 본 실험에서 백미 100 ppm 처리구를 제외하고 4회 처리구가 3회 처리구보다 현미 및 백미 내에서 Se 함량이 높았으며, P+Se 40 ppm과 Se 40 ppm 간의 유의차는 없었다. 따라서 농약을 따로 처리하는 과정은 생략하여도 무방할 것으로 사료된다. 식품의약품안전처(2010)에서 공시한 사람의 일일 Se 권장 섭취량은 50∼200 μg⋅kg‐1이며 상한 섭취량은 400 μg⋅kg‐1로 정해져 있다. 950 μg⋅kg‐1 이상 섭취 할 경우, 중추신경계, 간, 심장, 폐 등에 독성을 나타내게 된다고 명시되어 있다. 따라서 밥 한 공기 당 함유된 Se 함량을 추산하는 것은 매우 중요하다. 한국식품영양학회에 따르면, 밥 한 공기의 용량은 보통 210 g이고, 이는 쌀 70 g이므로 Se 정량 단위 μg⋅kg‐1를 이용하여 계수 값을 계산하면 실제 섭취 가능한 밥 한 공기 당 Se 섭취량을 알 수 있다(Table 4). 일반적으로 우리나라 국민이 음식을 통하여 섭취하는 Se 평균은 68.6 μg⋅kg‐1이므로 백미는 20 ppm 처리구(103.77 μg⋅70g‐1), 현미는 일반 쌀과 4 : 1로 혼합하여 섭취한다면 100 ppm 처리구(368.82 μg⋅70g‐1)가 가장 적합하다. 백미 40, 60, 100 ppm 처리구는 Se 섭취 권장 기준을 초과하므로 다른 일반 쌀(무처리)과 혼합하여 섭취하는 것이 적합한 것으로 사료된다. Basic structure of selenomethionine, selenocysteine (adapted Kim, 2008). Foliar application time and times in rice plant with organic Se. DAS, days after sowing. Disposition of experimental plot for rice cultivation and organic Se treatment in paddy field. Those treatments are referred to Fig. 2. 1)Those treatments are referred to Fig. 2. 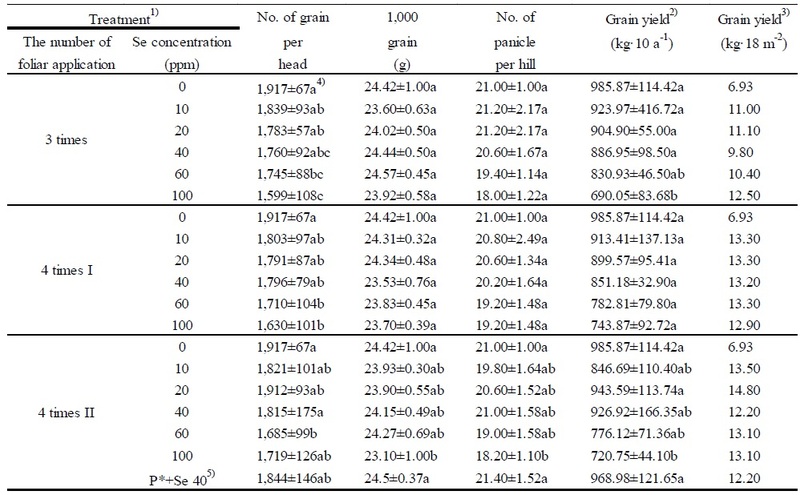 2)Calculation of grain yield: number of head per 1 m2 × No. grain per head × No. panicle per hill × 1,000 grain ÷ 1000 3)grain yield: substantive harvested grain yield. 4)Within each column, values follow by the same small letters are not significantly different at P < 0.05, using Tukey’s multiple‐range test (n =3). 5)P*+Se 40: The mixture of pesticide (10 ml) and organic Se 40 ppm. Se contents in various part of the rice. a), Se concentrations (mean, n =9) represent the average of sum Se contents with all the number of application(3 times, 4 times I, 4 times II); b), the number of application (mean, n =9) represent of average of sum Se contents with all concentrations (10, 20, 40, 60, 100 ppm). These data are recalculated from Table 3. 1)Those treatments are referred to Fig. 2. 2)Within each column, values follow by the same small letters are not significantly different at P < 0.05, using Tukey’s multiple‐range test (n=3). 3)Within line column, values follow by the same capital letters are not significantly different at P < 0.05, using Tukey’s multiple‐range test (n=3). 4)P*+Se 40: The mixture of pesticide (10 ml) and organic Se 40 ppm. 5)ND: not detected. 1)Uncooked rice 70 g = cooked rice 210 g in a bowl. 2)Those treatments are referred to Fig. 2. 3)Within each column, values follow by the same small letters are not significantly different at P < 0.05, using Tukey’s multiple‐range test (n=3). 4)Within line column, values follow by the same capital letters are not significantly different at P < 0.05, using Tukey’s multiple‐range test (n=3). 5)P*+Se 40: The mixture of pesticide (10 ml) and organic Se 40 ppm. 6)ND: not detected. 1. Cheong, Y. H., Han, M. J., Sung, S. J., Seo, D. C., Kang, J. G., Sohn, B. K., Heo, J. S., & Cho,J. S. ((2009)). Effects of selenium supplement on germination, sprout growth and selenium uptake in four vegetables.. Korean Journal of Environmental Agriculture 28. 179 - 185. 2. Choi, H. S., Kim, W. S., Kim, H. J., Choi, K. J., & Lee,Y. ((2010)). Variation of soil and leaf in a 'Wonhwang' pear orchard applied by selenium solution.. Korean Journal of Organic Agriculture 18. 541 - 548. 3. Choi,I. D. ((2010)). Physicochemical properties of rice cultivars with different amylose contents.. Journal of the Korean Society of Food Science and Nutrition 39. 1313 - 1319. 4. Jang,B. C. ((1997)). Absorption and accumulation of Sr–85 by rice (Oryza sativa L.) and its transfer factor from soil to plant.. Journal of Korean Society of Soil Sciences and Fertilizer 30. 184 - 188. 5. Lee,M. H. ((2003)). Selenium in human nutrition and health.. Journal of Korean Association of Cancer Prevention 8. 36 - 44. 6. Park, J. H., Nam, S. H., Kim, Y. O., Kwon, O. D., & An,K. N. ((2010)). Comparison of quality, physiochemical and functional property between organic and conventional rice.. Journal of the Korean Society of Food Science and Nutrition 39. 725 - 730. 7. Song, S. J., Kim, Y. R., Han, S. G., & Kang,Y. G. ((2006)). Foliar absorption rates of 45Ca‐labeled calcium compounds applied on tomato and citrus leaves.. Korean Journal of Soil Science and Fertilizer 39. 80 - 85. 8. Yun, H. K., Seo, T. C., Zhang, C. H., & Huang,H. Z. ((2005)). Effect of selenium application on growth and quality of Chinese Cabbage (Brassica campestris L.) grown hydroponically in Perlite media.. Korean Journal of Horticultural Science & Technology 23. 363 - 366. 9. Yun, H. K., Zhang, C. H., Seo, T. C., & Lee,J. W. ((2006)). Effect of selenium application concentration and periods on growth in garlic.. Journal of Bio‐Environment Control 15. 346 - 351. 10. Yun, H. K., Zhang, C.H., Seo, T. C., & Huang,H. Z. ((2007)). Development of techniques for the production of selenium and germanium‐enriched Chinese cabbage and pepper.. Journal of Bio Environment Control 16. 180 - 185.